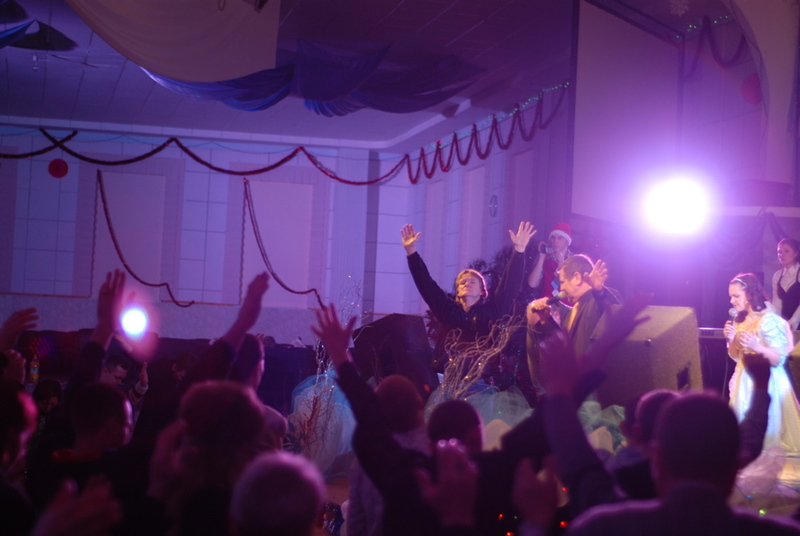 I had the incredible privilege of joining a team of people from my church (Waterloo Pentecostal Assembly) to go to Ukraine to visit some orphanages and serve there. The trip was from December 27 – January 6th. This series is an account of my time there. Well today was the day I left for the country of Ukraine on a missions trip with my church. I’ve been looking forward to the trip but also a bit pensive about it. Not knowing what to expect AND knowing I’ll miss my family I’m somewhat pensive about the days ahead. The flights were fairly uneventful. We had about a 1 hour layover at Frankfurt which meant we basically went to the boarding gate after landing from Toronto and waited to get on the next leg of our journey. 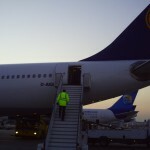 What was interesting for me was this was the first time I had ever disembarked from a plane on the tarmac and re-embarked the same way (at Frankfurt airport). There was something surreal about getting on and off the plane in the open air versus the covered bridge-ways I’ve been used to in the past. While waiting for the rest of the team to get through customs I got a chance to observe the airport lobby. Definitely a throwback of about 30-40 years in terms of looks and feel. Was also a much more condensed space than I thought there would have been at the airport. 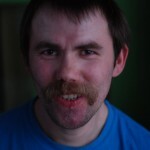 An apartment had been arranged for the team and myself to stay at temporarily in Kyiv. The apartment itself was fairly small and the staircase leading to the appartment had the lovely smell of garbage wafting through it (probably because of the garbage chute that went down the center of the stairwell). 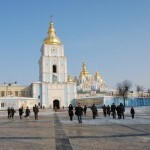 One of the things I noticed while driving around with Ed Dickson (who is the missionary in Ukraine that we are working with) is the amazing architecture in Ukraine AND the number of people walking. 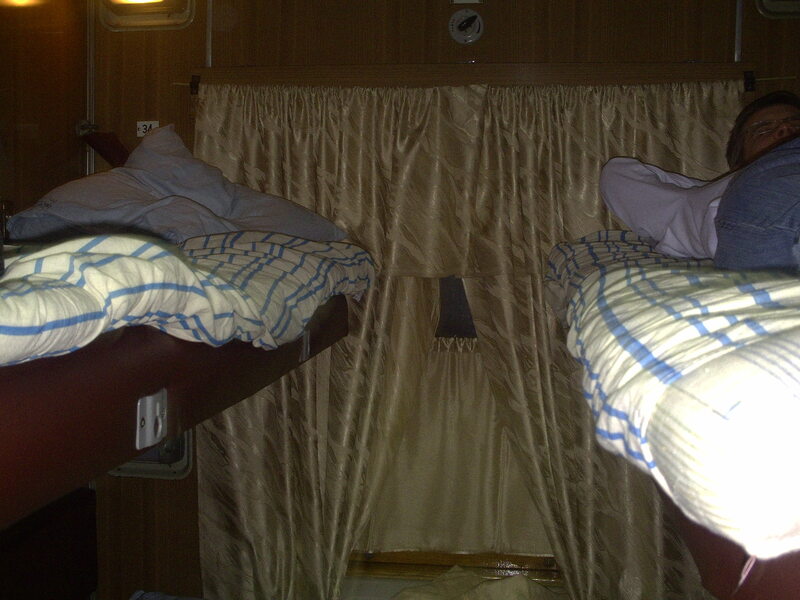 This is the room we slept in on the "sleeper train"...more like a crate! I should probably mention a little bit about our train ride to Krivoy Rog. 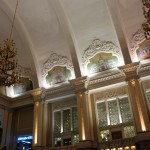 The train station in Kyiv was really big and had that old European look that gave a sense of stepping back in time. 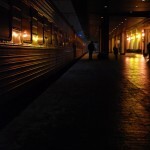 We boarded what is called a “sleeper car” – named that way because it travels overnight and people typically board it, sleep until their destination and then are ready to start their day when they arrive. Train travel is still a very important way of getting around in this country. 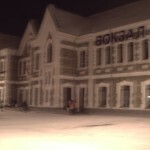 The trip to Krivoy Rog took about 7 hours by train as it doesn’t travel very fast and will often have stops along the way. The team was pretty tired from the flight and so we were looking forward to the chance to sleep but for many of us it was a forlorn hope as the temperature on the train was extremely warm! 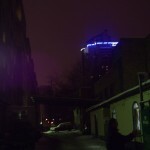 Without any way of adjusting the temperature I tossed and turned through the night and there was more than a few times where I got up and fumbled my way out of the small 4 bunk room to get some “fresh air” in the hallway. I think I lost about 5 pounds that night just through sweating! Well that’s it for this entry! Stay tuned for more in the coming days! 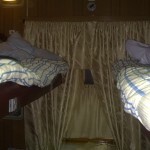 This is the room we slept in on the “sleeper train”…more like a crate! 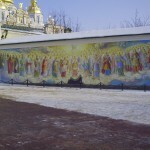 This is the second entry in the series I am writing about my trip to Ukraine – I didnt have daily internet access while there so I recorded each day for later publishing. And later is now. went to boys rehab and watched a presentation they were putting on. Wow! Pretty creative stuff! They welcomed our team and greeted each us with home made “Happy New Years” pins. 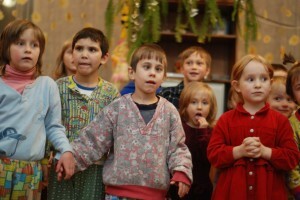 In Ukraine New Years is a huge deal, and even bigger than Christmas (their Christmas occurs on January 7th)! 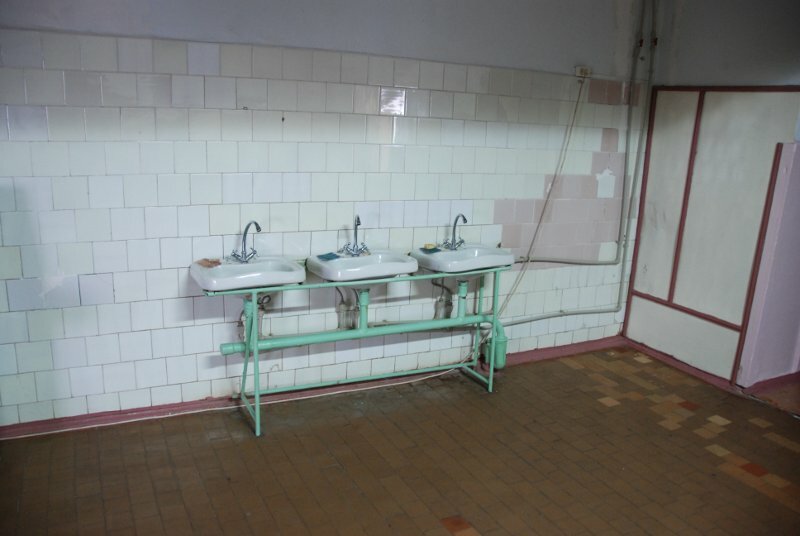 We were given a tour of what we would be working on at the boys rehab (sink area, showers, and front entryway) In Ukraine the front entryway of a building is the most important feature of the building. The front entryway of the building is a “status” thing. We headed back to where we are having our meals at a small cottage behind the local pastor’s house (Pastor Gregory). We had an awesome lunch of potatoes, salad, bread and meat, fish sticks and awesome potato soup with some sort of meat ball in it. 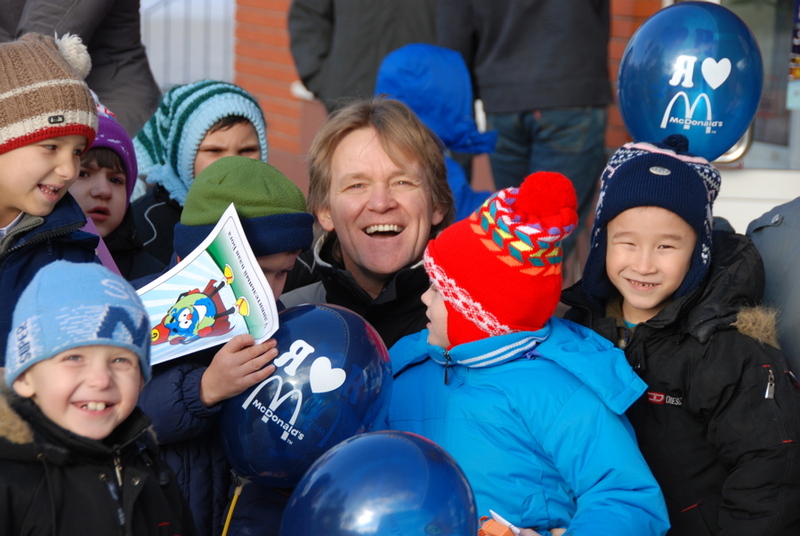 After lunch some of the team went to observe McJoyful Christmas in action at the Krivoy Rog McDonald’s. I went with others of the team to an orphanage Ed hadn’t been too yet. On the way to the orphanage we stopped at mobile phone place for one of the team members. Pretty much everyone has a cell phone in Ukraine (reminded me of what it was like in Africa). Ed pays 10c/min to anywhere in Ukraine, 20c to anywhere in the world – and ALL incoming calls are free! Stink – North America (especially Canada) is WAY behind the rest of the world when it comes to wireless access and pricing. Watching the preformance at the kid's shelter. The orphanage we visited is actually a shelter that serves as a temporary home for children found on the streets, abandoned or removed from dangerous homes. 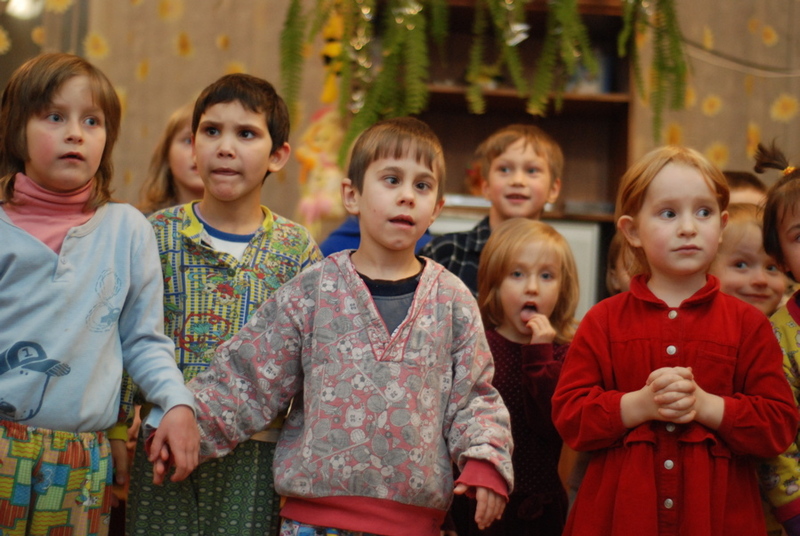 These children stay at the shelter until they are placed at an orphanage or (best case scenario) adopted by a family in Ukraine. Number of beds crammed in one room that is about 24′ x 30′ = 20. At this shelter we watched another presentation being done by the kids and workers. Ukrainians love to dance and act. Very colorful and exciting! What was cool is that they were so excited there were some visitors to watch them perform! The team all met together again for dinner and supper was a really neat chicken pasta dish, another type of salad and a neat desert. The team had a really good first evening sharing time after supper discussing what the next day would bring talking about the impact the trip was having. One of the team members talked about giving away clothing he brought. Neat seeing how this is impacting folks. 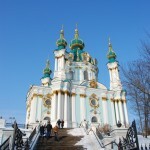 This is the third entry in the series I am writing about my trip to Ukraine – I didnt have daily internet access while there so I recorded each day for later publishing. And later [much later actually] is now. started the day out with a breakfast of an egg omelet of sorts and a small dough cakes with a sweet cottage cheese sauce – very delicious. For the morning, some of team went to the McJoyful today, some went with Ed to a children’s hospital (for infants) and a crew went to work on the boys rehab. I went with the team to the boy’s rehab. We tore out the old sinks, stuff that would usually be thrown out back in Canada but here wanted to have them put to good use and reuse them in the workshop. Had fun working with the guys I was with today and the two workers (Roma and Andrew) at the center. 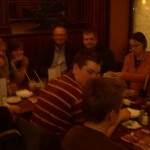 We met up with most of the team for lunch. (Have I said they are feeding us well yet?) 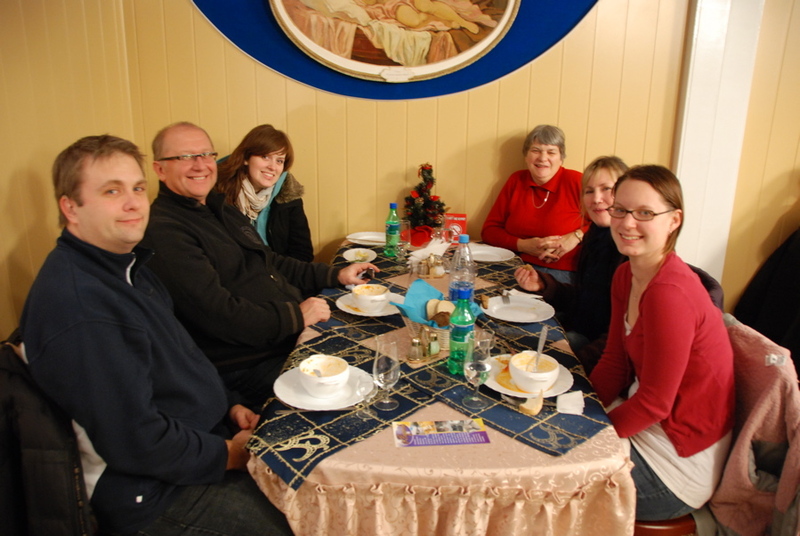 and enjoyed a meal of some cabbage salad, soup, and bread, cheese and meat. Heard the story of how the team that went to the children’s hospital ended up buying some life-saving medication for a baby boy who couldn’t swallow properly which the hospital didn’t have money for. One life changed because of divine appointment! They were also given the news by the director that her hospital budget was being cut by the government by 50% and food budget by 2/3rds – this when they already struggle to make ends meet. In the afternoon most of us went to a shopping mall where we bought diapers, soothers, a scale for weighing the babies and other things for the hospital. The mall was just like most shopping malls you see in the west, with prices very similar to what you’d find back home. You wonder how people can even afford to shop there (Ed informed us that this mall services a population of about 800,000) You can actually see the children’s hospital building from the mall. What a contrast between the wealthy and the poor in this country. When standing outside waiting for the rest of the team I noticed the old people and got wondering what it must have been like for them to see all the changes in their country over the years. Certainly the pace and rate of change has been dramatic compared with people of similar age in our country! Going to the hospital and presenting the gifts to the women was absolutely amazing. To see their joy and gratitude at receiving this unexpected gift was extremely rewarding. To know that the gifts were paid for by people back home makes it even more worthwhile. Cute little guy. 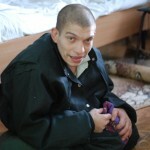 Konstantine couldn't swallow and we were able to purchase enough medicine to help him with that! Probably the most troubling/touching was actually going to the nursery ward and holding the babies that were there. We dressed in hospital gowns and washed our hands before entering in. 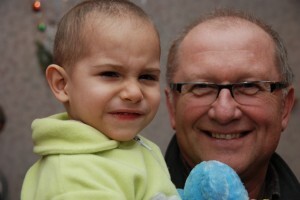 I held Konstatine, the baby boy who was given the medication. You could literally feel and see these babies soaking up the attention we were giving them. 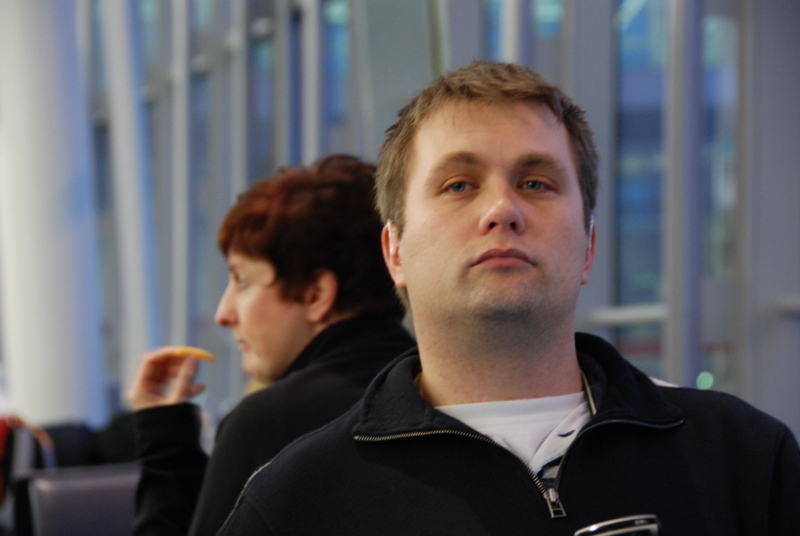 Konstatine wouldn’t take his eyes off me. We learned that out of the eight babies in that room, all of them except one were abandoned babies. (talk about the culture of abandonment that has gradually seeped into this country over the years where the state did not discourage parents from giving up unwanted children to them – over years this gradually got accepted until there is no shame in doing so. Which has led to real problems today. We went to an internet café afterwards. 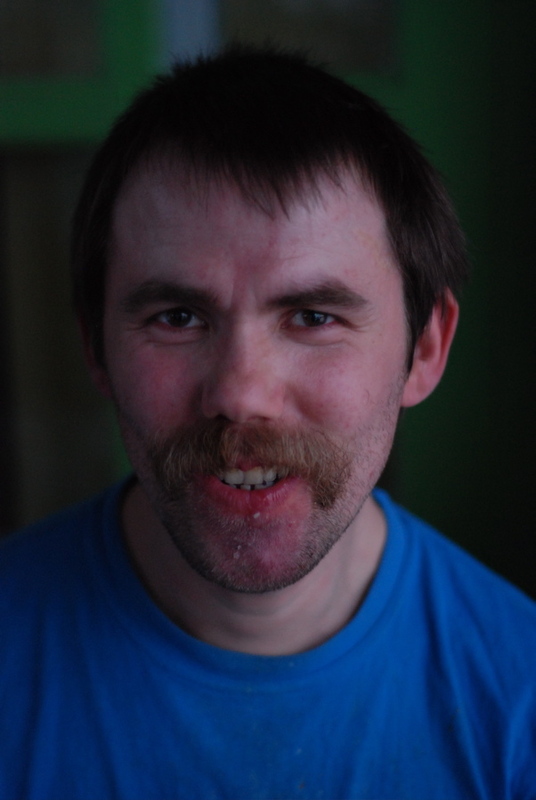 It was fun working on a computer displaying Ukrainian – of course, thanks to the amount of time I spend on a computer it wasn’t difficult – ha! 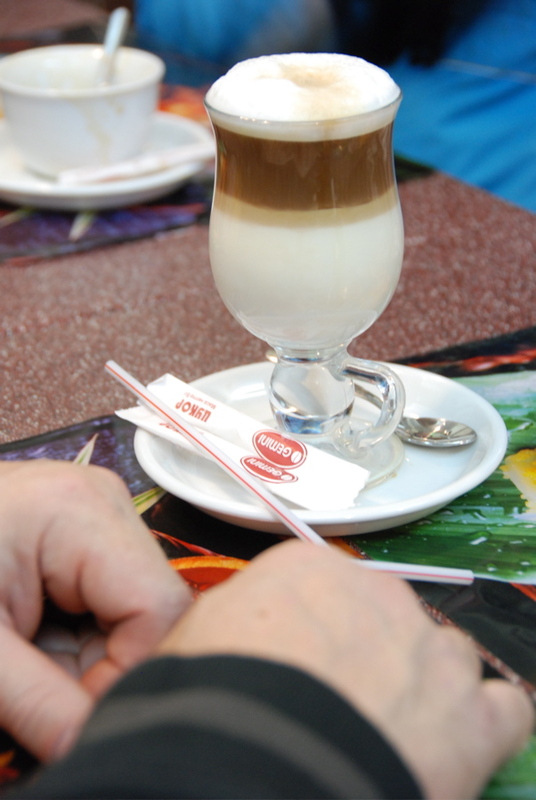 Had cappuccino at the “Grand Central” pizza place (décor was not much unlike what we’d see in really nice restaurants in our part of the world). Supper was a chicken schnitzel, fried potatoes and mushrooms, salad. Met Pastor Gregory coming back for supper (Ed, Walt and I are actually staying at the guest cottage behind his home and the entire team is eating dinner in a dining room behind the guest cottage – the people in the church are cooking our meals and the money we’re paying for the lodging and meals is going towards the church). 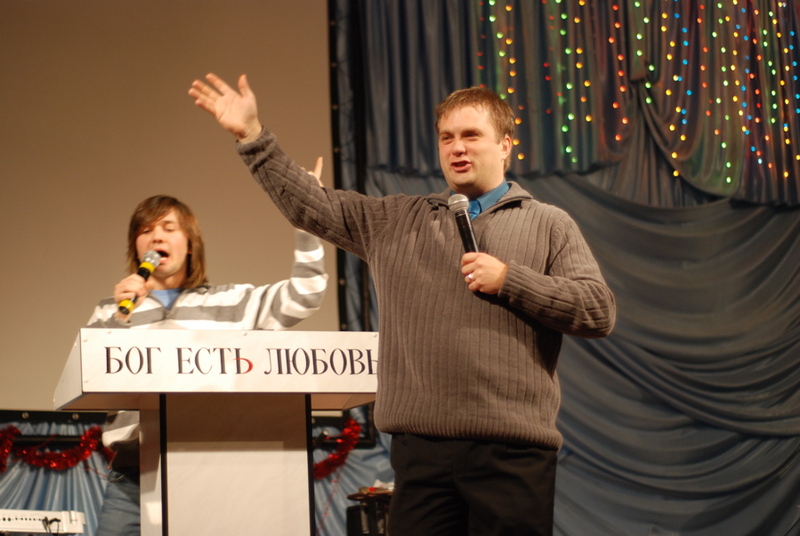 He invited me to preach at their Thursday evening service as well as their Sunday service. I’m looking forward to it! Man what an opportunity – amazing that God had already put a couple messages in my heart and I was struggling with which to preach on the Sunday…now I know I’m to preach both of them!! Contrast between rich and poor was much talked about. Ed – one of the greatest challenges and “goals” is to get the “have’s” in this country to care and give to the “have-nots” right in their backyard. Pastor Gregory shared with Ed when asked (not at dinner but on another occasion) that the impact of the teams on the church has affected the giving attitude in the church. One person mentioned about how this got them thinking about the opportunities back home we have to help those in need and what we can do there if we really open our eyes and allow our experiences here to motivate us when we get home. Back at the cottage the three of us (Ed, Walt and I) got talking about what it’s like for missionaries on the field – very interesting conversation (won’t go into detail here). During the conversation, the passion in Ed for what he does really came through and you can see that his heart is really in what he does – how refreshing to see and experience. Spent some time working on the messages I believe God wants me to share…trying to be sensitive to which one gets shared each day. This is the fourth entry in the series I am writing about my trip to Ukraine – I didnt have daily internet access while there so I recorded each day for later publishing. And later [much later actually] is now. after breakfast I spent time in prayer and message preparation. Still don’t know what I’m going to preach tomorrow and Sunday! 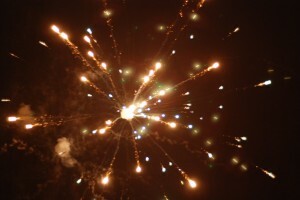 Joined some of the team to go to the bazaar to get a picture frame (for the picture of the ladies giving the teddy bears) and then fireworks for the New Years Eve celebration. Went to McDonald’s to hopefully meet up with a team there for the McJoyful but they were already done. Went to a mall near the McDonald’s – Walt wanted to look at some boots for his wife. There’s some nice footwear – price is fairly comparable to Canada BUT what is different is the quality for the price. 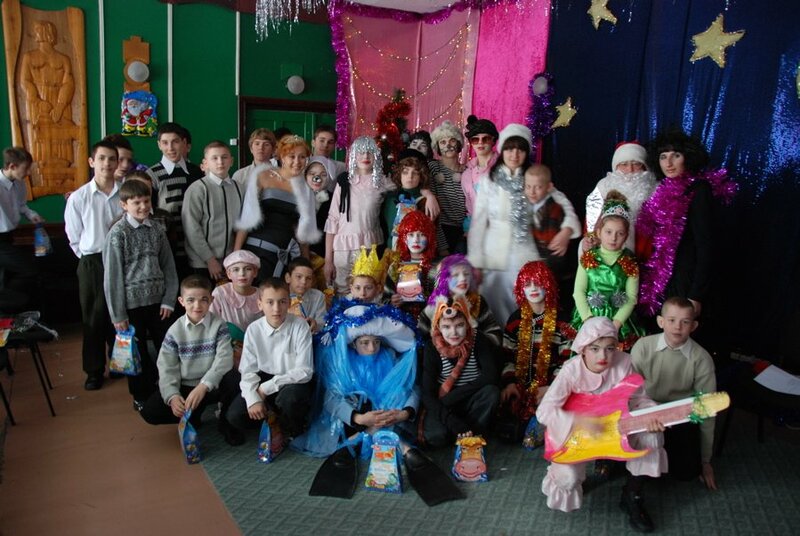 FASHION is a big thing in Ukraine (and light years ahead of back home). This is our team leader Walt, with one of the guys from the shelter that we visited. After lunch we went to the Sonshine Orphanage, to meet the director and talk about what we had planned for the evening. She was absolutely thrilled with what we had planned for the kids. 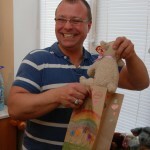 This is Brendan with one of the bags made by the kids at his school back home. We filled these bags with toys and stuff for the Sonshine Orphanage kids. The bags were paper bags decorated by kids from Brendan’s school (he’s a custodian there). We had stuffed them with items we brought with us and stuff some of the team had bought at the bazaar earlier in the day. 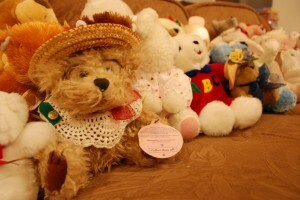 They were also stuffed with teddy bears one of the elder ladies at WPA had collected over the years. Some ladies from WPA had prayed over these bears. Get this – we brought around 40 bears with us not knowing what orphanages we would visit and how many kids would be at the orphanages. It turns out that we had the right number of bears for the kids at the shelter and they JUST LOVED THEM! A highlight for me was seeing the workers impacted by the love showered on the kids. 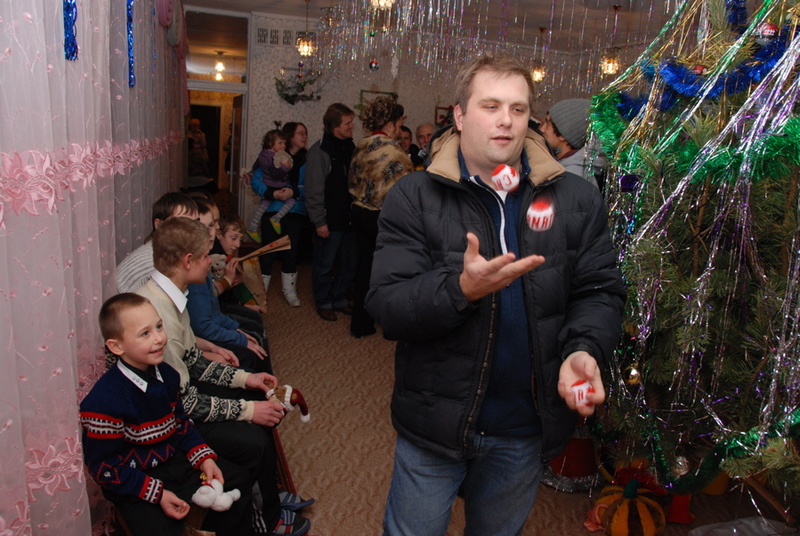 I had SO MUCH FUN juggling for the kids at the shelter. But I should have taken my down-filled coat off...I was drenched in sweat after! Another highlight was juggling for the kids. I just had a blast just doing simple things with them – even though there was a language barrier we were still able to communicate! We then went and had a quick supper. I was supposed to have dinner with Pastor Gregory and Ed but because of the shortened schedule for the evening (we had to make a change with the original plans for the Sonshine Orphanage) the supper with Pastor Gregory was cancelled and I ended up getting to have dinner with the team. Although I was a bit disappointed at not being able to have supper with the pastor and get to know him a bit I was very happy to be spending the time with the team. The humour on this trip has been hilarious. I can’t remember ever laughing so hard with such a wide variety of people. Numerous times I have almost fallen off the bench at dinnertime! 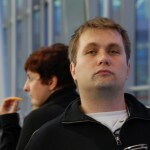 Today I spent a great deal of time taking the Ukrainian Bus (Mushuka?) in traveling with the team and walking where we needed to go. After Supper we went to the Sonshine Orphanage around 7-7:15pm and lit off fireworks for them. For $200 USD we got the equivalent of about $1,500 worth back home. The fireworks were awesome and it was really cool seeing the kids enjoy them. Sonshine has kids ranging in age from about 5-6 all the way up to 16-17. They were in different age groupings after the fireworks in their sections of the orphanage and we visited 10 different rooms (about 200 kids in all). We passed out the gift bags and spent a few minutes with each age grouping. Again, I enjoyed seeing the kids reactions but I think I enjoyed seeing the workers reactions more! Following Sonshine some of us (who didn’t fit in the van) walked to the local Church (that Pastor Gregory pastors) and joined in with their New Years Eve celebration. 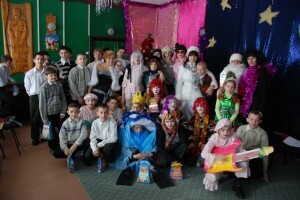 New Years Eve and Day in Ukraine is celebrated like our Christmas back home. They don’t give out gifts on Christmas (which is January 7th here) but give gifts out on New Years Day. Everyone usually stays up to 6 or 7 in the morning. 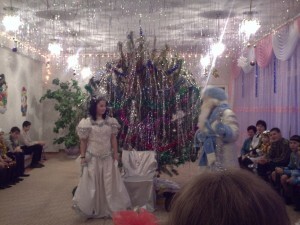 New Years in North America is nothing like what they do here in Ukraine. 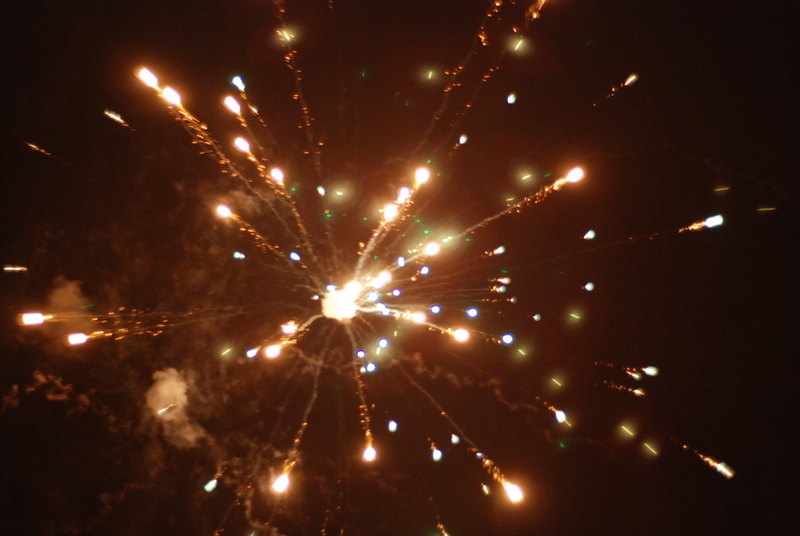 People are letting off fireworks from their balconies, from their backyards…everywhere. Incredible. The church prayed in the New Year and then everyone went outside to enjoy the fireworks. The youth dressed up and had a costume party. 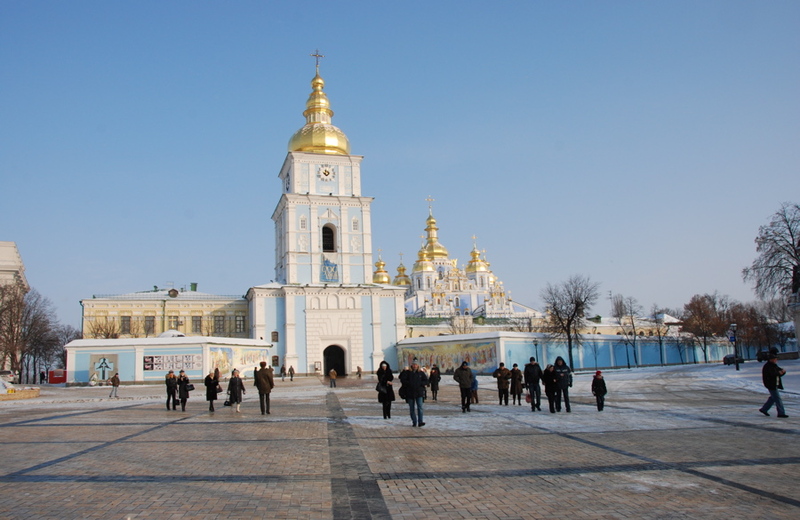 This is the sixth entry in the series I am writing about my trip to Ukraine – I didnt have daily internet access while there so I recorded each day for later publishing. And later [much later actually] is now. One of the girls from our team holding a baby from the children's hospital. To children’s hospital to drop off girls who were going to visit with babies there. To McDonald’s to drop off one of the team members for McJoyful. Went to hospital to talk with the director of the hospital and pick up the girls who we dropped off earlier. We then dropped the girls off to shop at bazaar (they were getting makeup and nail polish and beauty supplies for using at the Sonshine orphanage in the afternoon). Took lunch for guys at rehab center who were continuing on the renovations there. After lunch we drove the girls to SonShine Orphanage so they could do the “beauty day” with the older girls at the orphanage. Went and picked up Brendan at McJoyfuls (went around to a few shops with Walt and his future daughter-in-law). Ed, Walt, Brendan and I went to another orphanage on the other side of town. They were in the midst of doing a presentation to a team from Georgia USA…we didn’t meet that team. 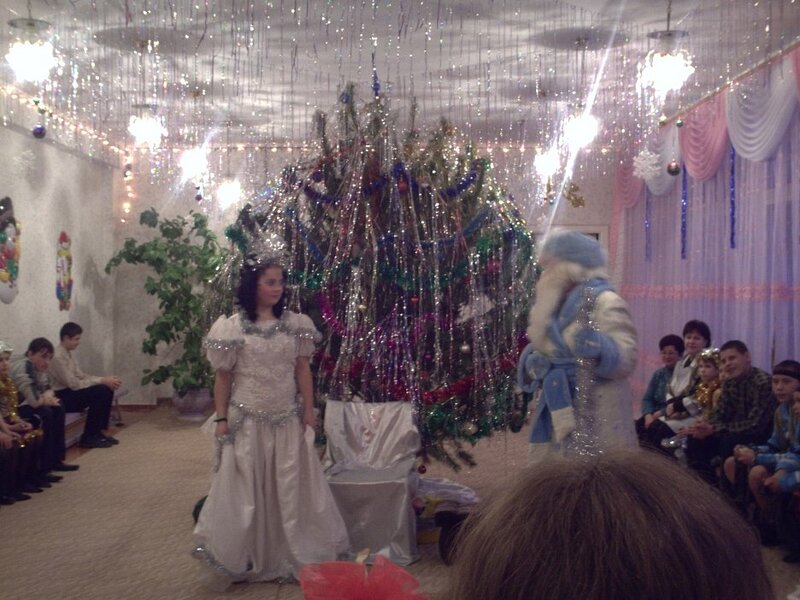 Director of the orphanage was dressed to the nines in about $1,000 worth of clothing. Apparently her husband is very wealthy. The orphanage is really top notch and it is evident the kids are well looked after. Director told us about a boy who had excelled at school and athletics and had been invited by a family from a church in Georgia to come to university there and they would pay all his tuition, lodging and food while there. Problem is, the boy did that and finished his grade twelve that he needed to finish (in America – Ukraine only goes up to grade 11) and then the people told the director they can’t pay for his university education there. This leaves the kid in a terrible bind because IF he hadn’t gone to America he would have been able to get a FREE education at Kyiv’s top university – but since he’s been out of the country he can no longer avail himself of that education!! Not nice. The director is hoping that the church in Georgia will help him. Went from there to see how the guys were doing back at the rehab center. Things are coming along with the construction but still moving slowly. Took the guys with us to the Okeh supermarket (what an interesting name for a store…) to pick up comforters for the shelter place. We managed to get 17 (at roughly $10USD apiece) that we delivered to the shelter. Pretty funny stuffing it into the minivan with 7 of us guys! We are giving Ed money to purchase 18 more for all the kids at the shelter. Headed back for supper with everyone else and we shared stories of our day. This is the seventh entry in the series I am writing about my trip to Ukraine??I didnt have daily internet access while there so I recorded each day for later publishing. And later [much later actually] is now. held a baby girl about 3 months old who had been taken from her mother just the day before because of poor care. Held Konstatine who we had brought medicine for. Konstantine had a problem with swallowing that would be easily solved by medication. 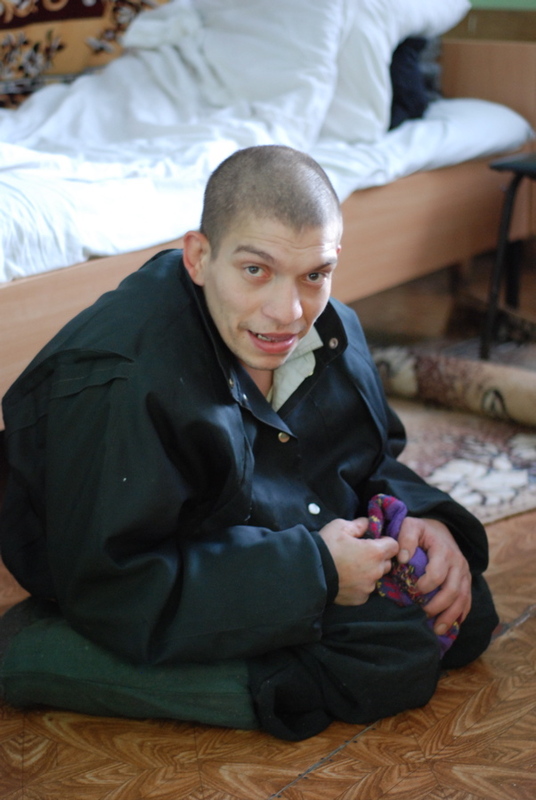 The hospital didn’t have the funds to pay for this medication and there was no one else as Konstantine’s caregiver. 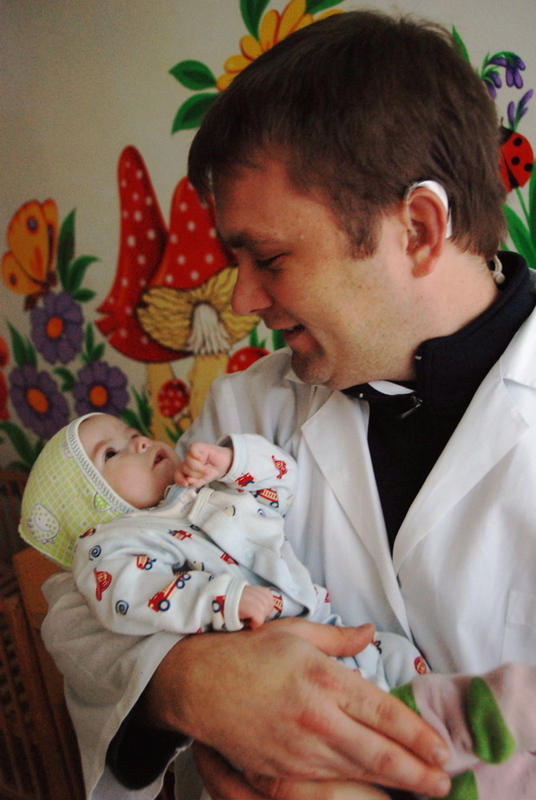 The medication only cost about $150 USD – easily provided by our team! Without it, his future didn’t look too well. .they came across to me as a defense architectural feature where machine guns could be pointed out (but maybe not the case?). After lunch the entire team went to a place called the Beuleuka (spelling?) home. 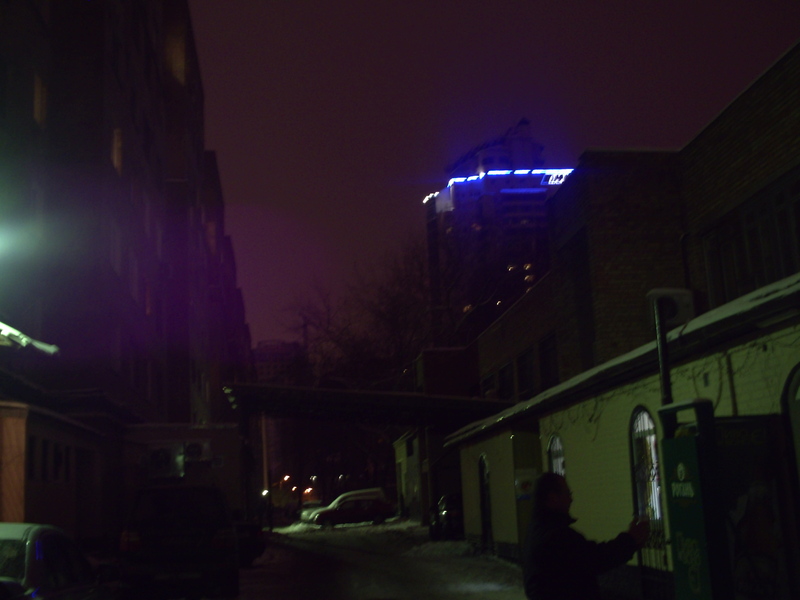 It is a place where handicapped and deformed people are shipped out to by the city. Its one of five such places that Eds ministry has got involved in helping. The first thing that hit us was the smell – it was hard trying to ignore it but it was ever present like a third person. People living there have all kinds of deformities and/or handicaps. We passed out bananas and chocolate bars and just spent time with them. The place itself is in a terrible state of disrepair and honestly I dont know how anyone could live there but Ed says you should have seen it when he first visited it! A lot of renovations and repairs have been done since he started helping out. Now there are other local churches involved in visiting, holding services and even bussing people to their services. 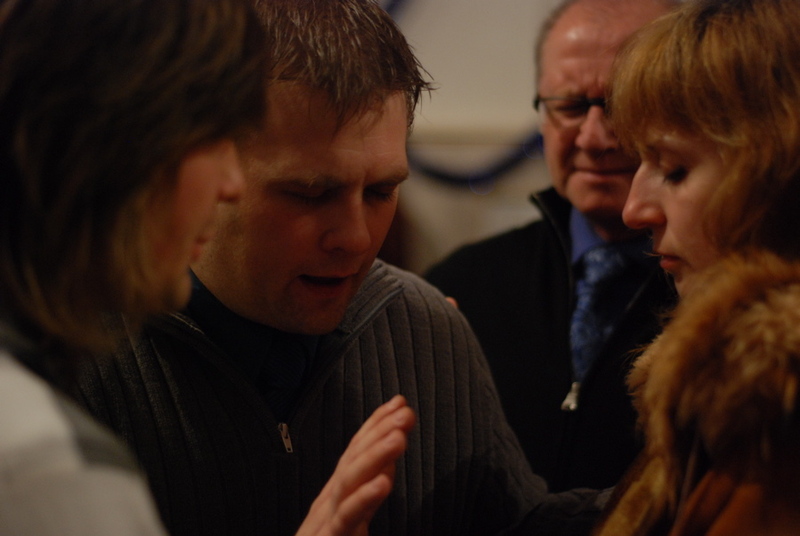 This is the first convert to Christianity at the Beuleuga. He's so on fire for Jesus that he's called the "pastor" by all the other people there! 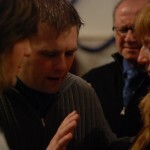 Ed introduced us to one of the inhabitants who was one of the first to receive Christ and is on fire for the Lord. Ed says he calls him a pastor because of all the spiritual care he gives the other inhabitants. Their spiritual fervor is amazing and they are probably closer to God than I ever will be. Itll be neat getting the chance to meet them again in heaven someday! After supper together with the team we all travelled together to downtown Krivoy Rog to try and find a place to do something fun together (i.e. play pool, bowling, laser tag). There was one place that had that kind of stuff but it was closed and so was another place. So we ended up going to the Grand Central pizza parlour again and enjoying coffee and a sundae. Nothing fancy but just a night out together with the team. This is the eighth entry in the series I am writing about my trip to Ukraine??I didnt have daily internet access while there so I recorded each day for later publishing. And later [much later actually] is now. 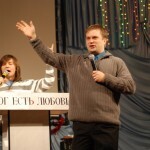 Church Service @ 11am  I preached  service was awesome! What was really moving for me was the response of the congregation as I preached and the freedom I felt in speaking. Having to go slower for the translator gives me time to think what Im going to say and I often veered from my notes. Of course, that was due to the leading of the Holy Spirit as well. During the service Pastor Gregory gave me a note asking me to give the altar call for repentance – that I was nervous for BUT I followed through because I believe we give the invitation and it’s God’s job to draw people. Well 7 people came forward and I led them through a salvation prayer with the translator using 1 john 1:9 (If we confess our sins he is faithful and just and will forgive us our sins and purify us from all unrighteousness). It was awesome! The entire church cheered for those who had given their hearts to the Lord and after praying I hugged each one of them. Pastor Gregory also had me pray for some needs people had written down and handed in. That was cool too! I was just blown away by this Sunday morning service and SO EXCITED about the new people joining the family of God!! Following the message Pastor Gregory had the team members and I pray for people who came to the front for prayer. Following the service we packed up our bags and loaded them in Eds van then had lunch. 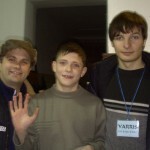 One of the boys I befriended at the Boys Rehab center (at farthest right is Yarris one of our translators). Then we went to the boys rehab center and they presented a program they had prepared for us. They also presented a framed picture taken of all the boys there. Following our time at the rehab center we then got on a rented Mushuka (bus) and started on our way to Kyiv (a 6-7hour trip). I don’t know what was worse, riding the Mushuka or taking the train! About 1 ½ hour into the trip the bus driver noted that one of his axles was hot and so we decided to have dinner at a restaurant down the road while a new bus was called in from Krivoy Rog. So we had dinner at this Ukrainian Restaurant with paintings of naked women on the wall by each table. Yeah, you read that right – it was “art”, everybody was kind of giggling like schoolkids. 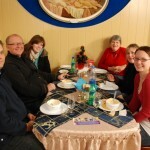 And no, this wasn’t a sleazy joint – it was a genuine Ukrainian restaurant… The food was really good however! (and no, I didn’t take any pictures of the art *rolls eyes*). When the new bus finally came we got on and started off again to Kyiv. However, we think the bus driver got lost a bit because we ended up not arriving until about 3am (were expecting to get there at 1am @ the latest (even with the bus troubles). I was almost delirious by the time I arrived there from lack of sleep. Boy was the bed ever good. Were spending the day in Kyiv and sleeping overnight at the Bible College here in the dormitory rooms. Looking forward to exploring the city tomorrow!! 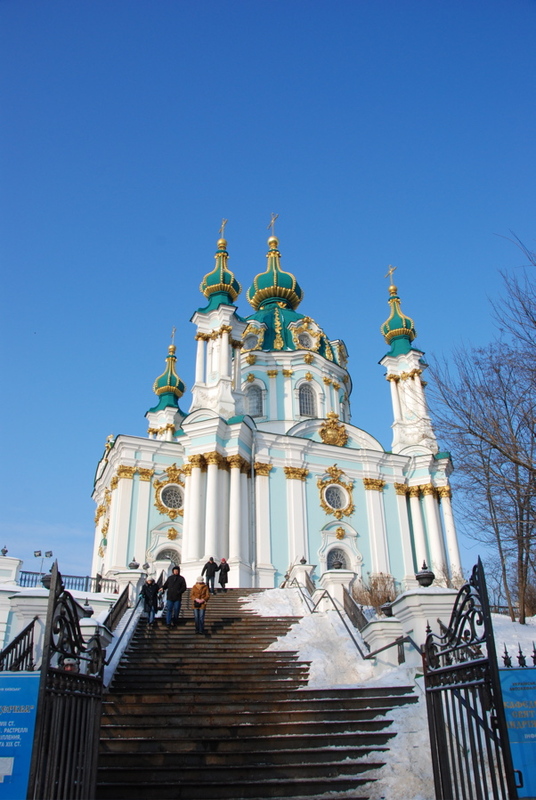 This is the ninth (and final) entry in the series I am writing about my trip to Ukraine??I didnt have daily internet access while there so I recorded each day for later publishing. And later [much later actually] is now. Woke up around 9am and left the Bible College around 10am. Traveled to a square downtown Kyiv. The architecture is amazing and got lots of pictures around the square. Interesting that a lot of the shops and stuff is under the city. Some of the team traveled by subway. From there we walked down the road by St. Andrews Cathedral (known as St. Andrews descent because legend/history has it that he was led to his crucifixion down that road. We stopped in a little café and crowded into there for some tea and to warm up (very cold day..was -11 to -13 degrees Celsius). After the café we did some souvenir shopping. There were a bunch of different little stalls lining the road on St. Andrews descent. You had to bargain if you wanted to pay a fair price for the souvenir’s. I was looking at a jewelry box to get my daughters at one stall and the vendor was asking 90 grivna for it. I said no. He said 80. I said no and started to walk away and then he said 70 grivna. I told him I might be back. The very NEXT stall had the same box marked for 45 grivna! At one of the last stalls a gentleman said I could have a box for 50 grivna and I bargained to get two for 80. I realize that its still probably marked up an incredible amount (and that setup of stalls is probably planned somehow so that by the time the tourist makes it to the last stall they think they’re getting an incredible bargain…) but nevertheless I came away happy with the purchase  alls well. From there we walked to an internet café in one of the below ground malls  man what a busy place! At least 100 computers networked together. 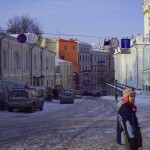 My internet usage was sparse and limited while in Ukraine so I welcomed the few times I could get connected. I was able to get connected and chat with my wife  awesome. From there some went to see Mother Russia while I stuck around with Walt, Ira and Johnny to shop around the area we were in. We went in various shops and I picked up some Ukrainian chocolates to take home. The next day was rather uneventful as we made our way back to Waterloo. It was kind of interesting going through customs and in some ways I was more nervous getting through Canadian customs than I was through Ukrainian! The Canadian customs agent I went through GRILLED me like crazy with all kinds of questions (while the other team members made it through no problem)…I must be special or something.